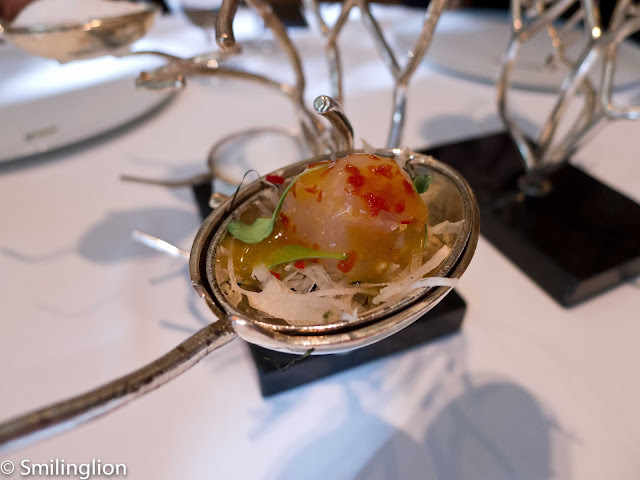 The whole idea of destination dining is to travel to a far-flung place specially to dine at a famous restaurant. This is no different from flying around to world to visit natural wonders or historical sights, except that these wonders or sights don't generally change within a short period of time, whereas a restaurant can no longer be a 'dining destination' simply with the exercise of the pen of a renowned reviewer or the votes by a committee. Gourmands have for a long time been travelling in search for good food, and in past few decades, the Michelin Guide (which was originally conceived to help truckers and other drivers find places to eat during their cross-country drives) was the de facto food bible on which recommendation foodies have relied to satisfy their gastronomical desires. A more recent phenomenon was the San Pellegrino World's Best Restaurants annual list, which ranked the restaurants from one to a hundred. 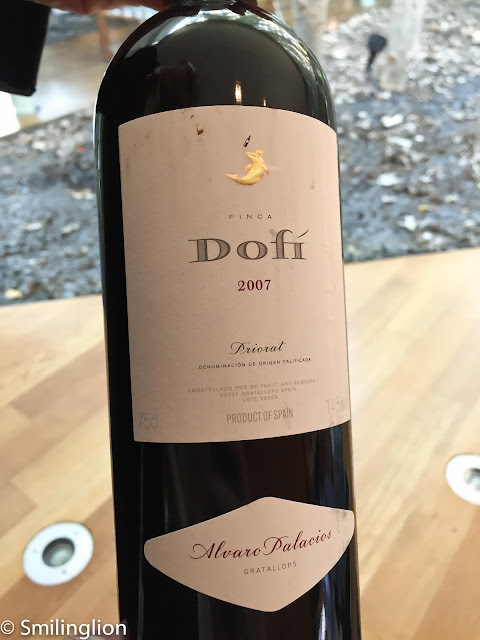 This created a funnel effect for demand for certain restaurants near the top of the list, which never really happened with the Michelin Guide (simply because there were plenty of three Michelin starred restaurants to go around, for those diners who wanted to eat at the best restaurants). 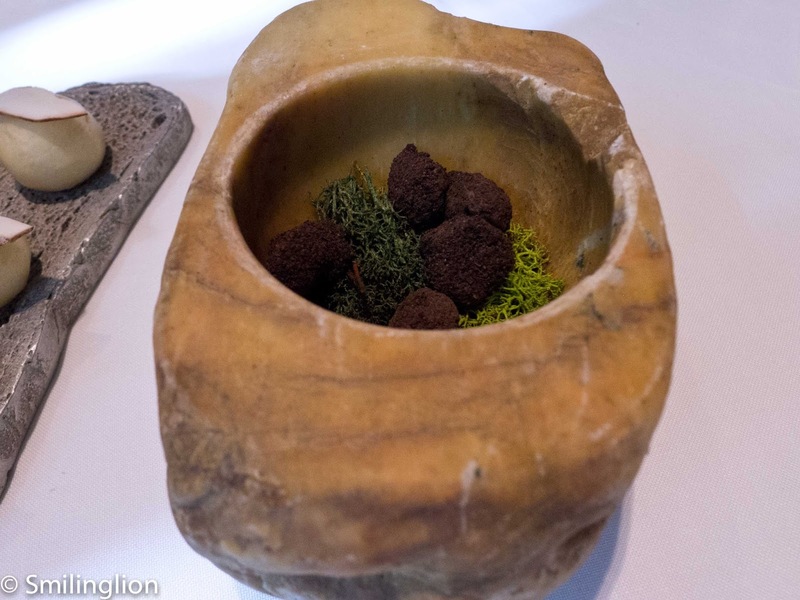 So a restaurant which showed at number one in a certain year would reasonably expect that most if not all of the world's gourmands would desire to dine there that year, if only to experience a meal at the best restaurant in the world. 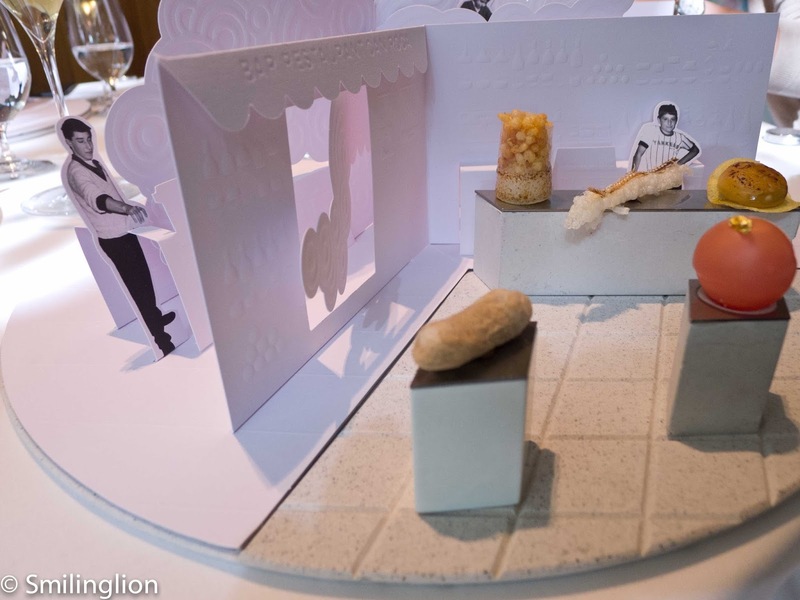 The publicity created by that would also attract many otherwise casual diners who will get curious about what the fuss is about and also desire to dine there. We have always been circumspect about the San Pellegrino World's Best Restaurants list, mainly because we felt that it is difficult to say with certainty (enough to put in print) that one restaurant is the best in the world. 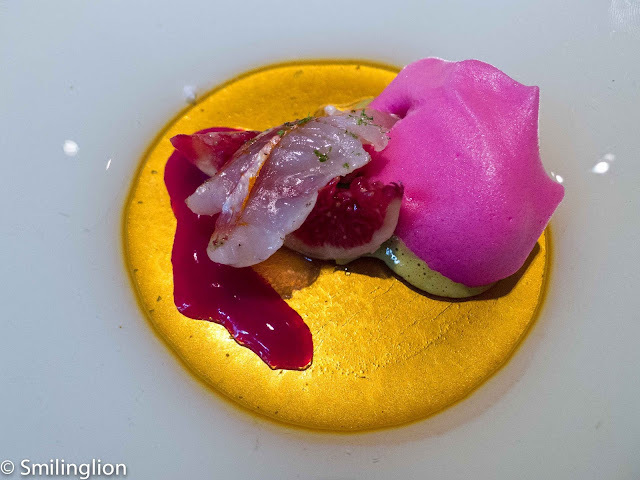 Also, the debate between that list and the Michelin Guide has been going on for years between food aficionados and to do so here as well would result in this post going on for pages. That said, we have not totally ignored this list, and have dined at many of the top restaurants in the list over the years. However, until now we have not dined at a reigning number one. 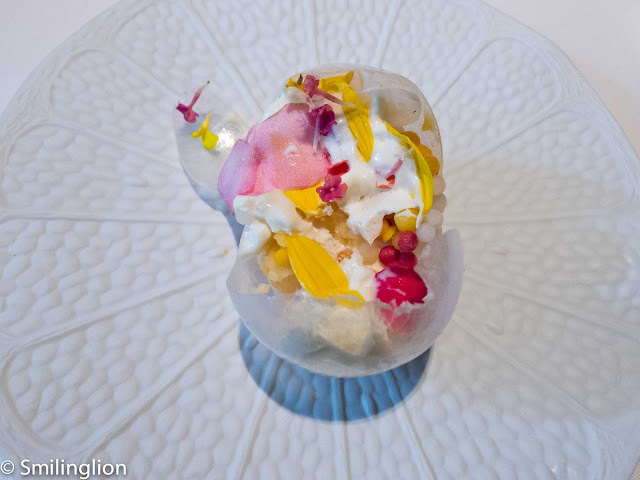 For a variety of reasons, we missed eating at Fat Duck, El Bulli and Noma (especially while they were at the top of the list), so when the opportunity came to try the current number one, it got us (and our vanity) quite excited. 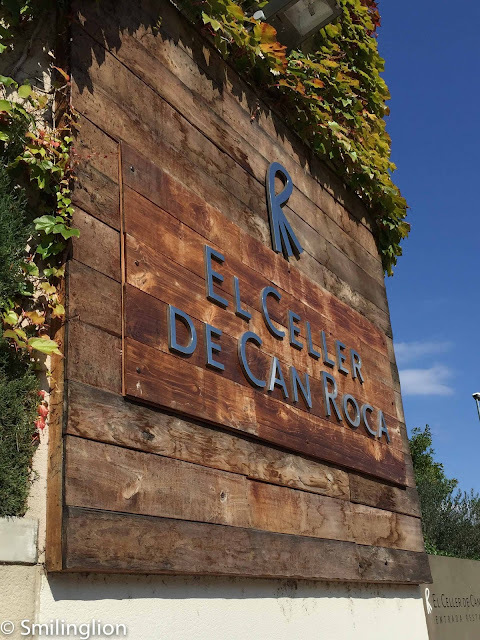 We had to make the booking exactly 12 months to the date of our desired dining date, and click furiously on the booking webpage at 12 midnight Spain time to ensure that we didn't miss the booking. 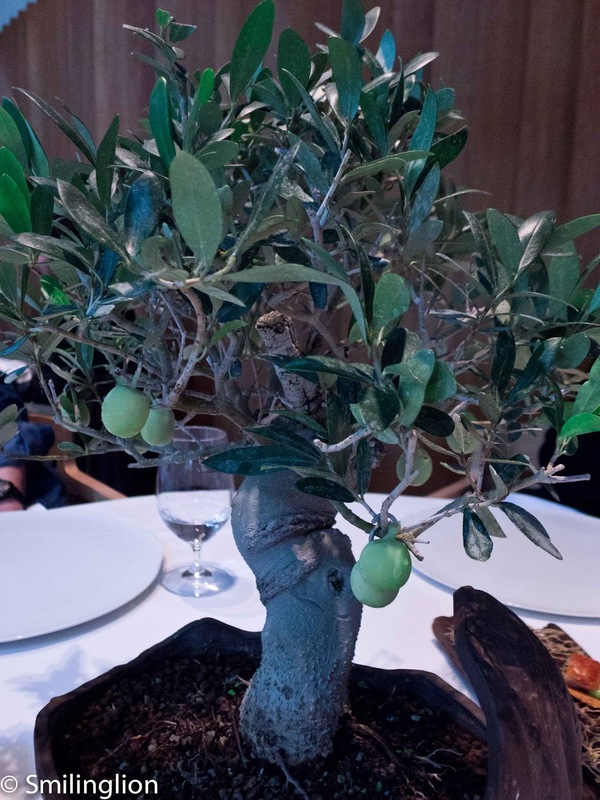 We never had to make a meal reservation one year in advance for any restaurant other than the number one on the San Pellegrino World's Best Restaurants list (we tried booking el Bulli a year in advance as well in the last year before it closed, but was unsuccessful); such is the effect on demand for the number one restaurant created by the list. On the long-awaited day, with great anticipation we travelled by high-speed train from Barcelona to the historic city of Girona (we even booked the train tickets way in advance, to avoid the event that the train which travels between the two cities several times a day would be fully booked), spent the morning in the city taking in the sights, then headed for the suburbs to the restaurant. 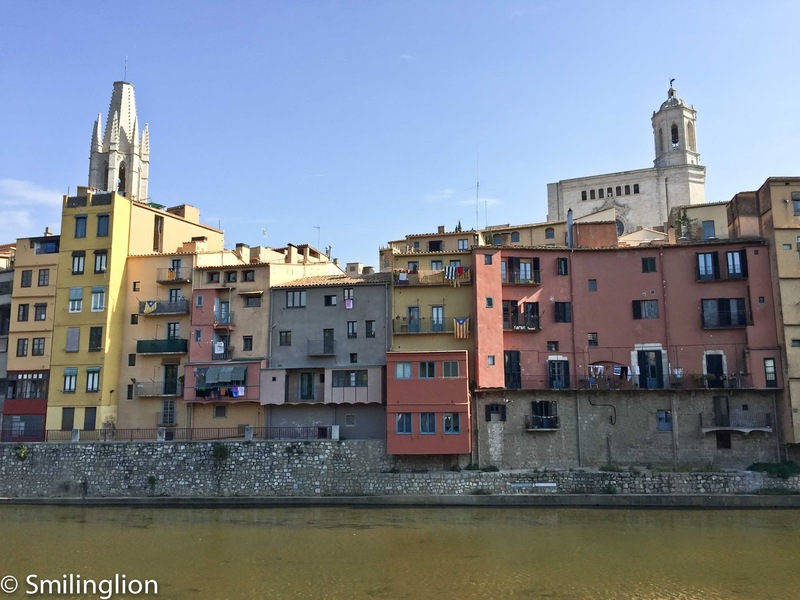 A total walking distance of more than 4km from the train station, then around the old town, then to the restaurant did well to work up an appetite. We arrived promptly at the grounds at 1pm, just as many other eager diners did. There was a feeling of excitement in the air, and it was like a red carpet moment leading to a glamourous Gala event (because of the way everyone was sizing up the others who had also somehow managed to secure such a sought-after table). 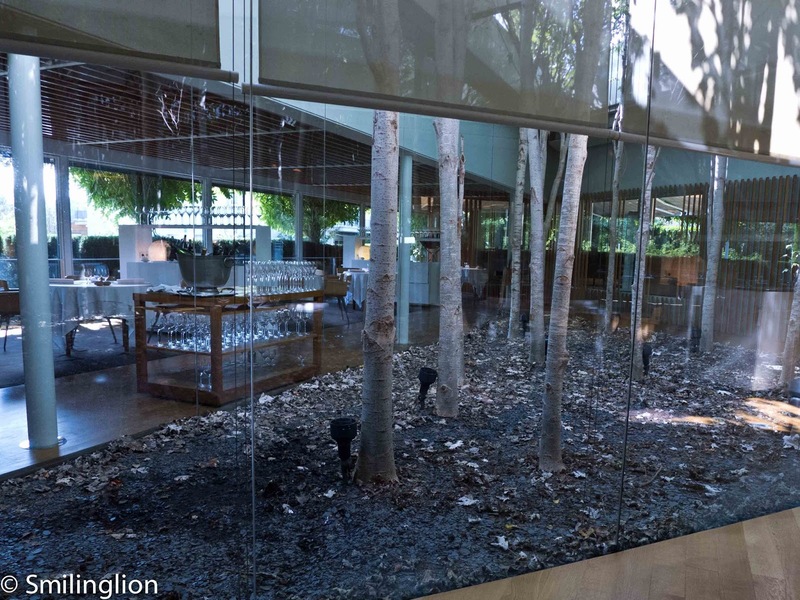 The restaurant has very charming grounds; there is a mix of the old residence and the new modern renovated areas including the dining room. There was plenty of light and throughout the meal we felt very cosy and comfortable. The wine list here was impressive: it came in large and very heavy booklets on a trolley which the sommelier had to push to our table. In it was a decent selection of wines at what we thought were decent prices (for a restaurant of this standing). 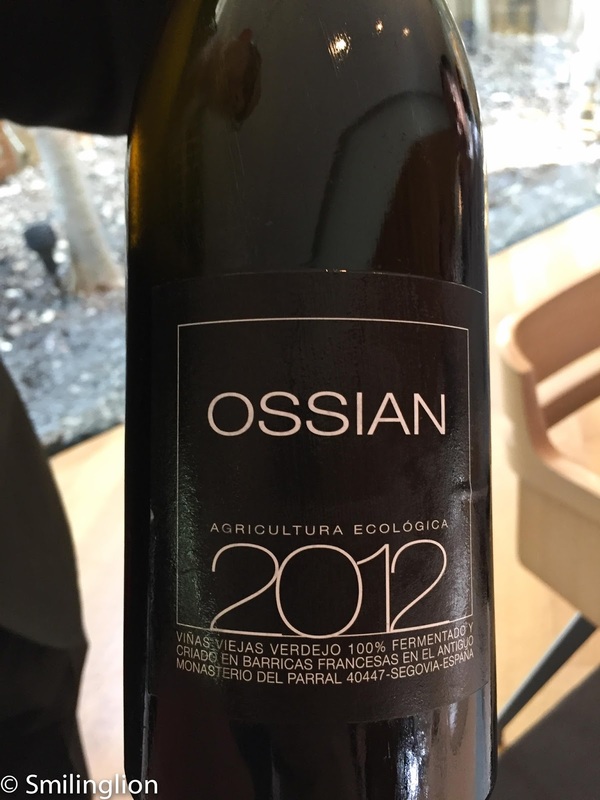 In the end we picked a white (Ossian 2012 - verdejo ) and a red (Finca Dofi 2007 - a Priorat) which accompanied us well for our meal. 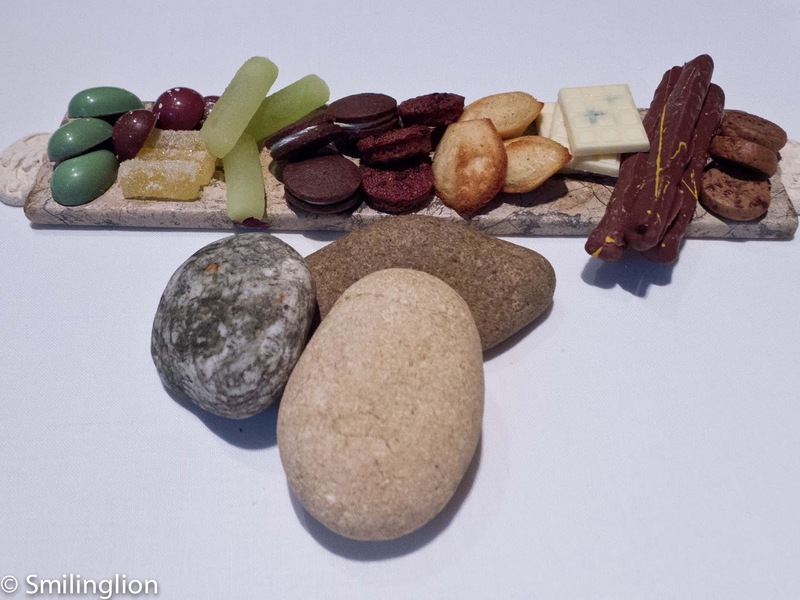 Our meal started off with a flurry of amuse bouches: all of them being served with the help of props, which seems the 'in-thing' for top modern fine dining establishments nowadays. 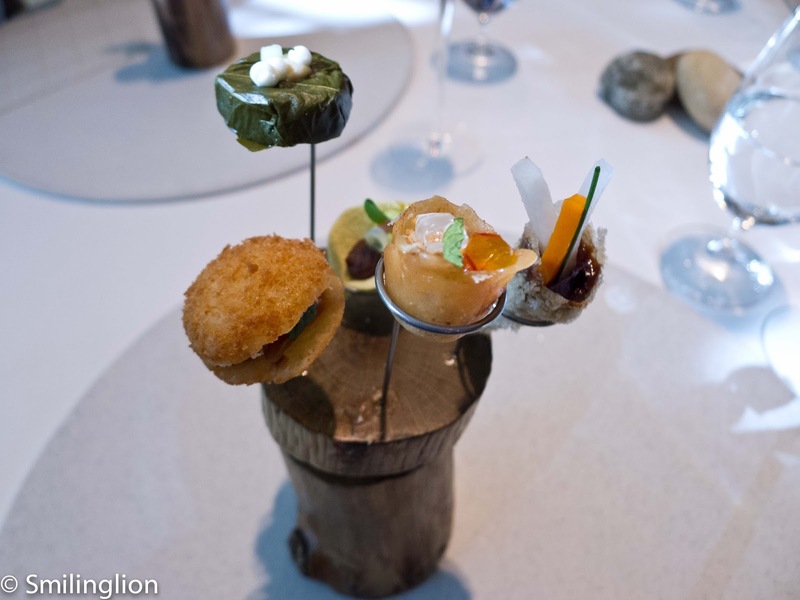 The first one was a few small snacks served in a large round paper lantern. The lantern was placed on our table for a few seconds then dismantled and taken away. The snacks were tastes from all over the world, with representation from China (pickled vegetables with plum cream), Korea (panco fried bread, bacon with soya sauce, kimchi and sesame oil), Turkey (tartlet of vine leaf with lentil puree, eggplant and spices, goat yoghurt and raw cucumber), Mexico ("burrito" with mole poblano and guacamole) and Morocco (almond, rose, honey, saffron, ras el hanout, goat yoghurt). 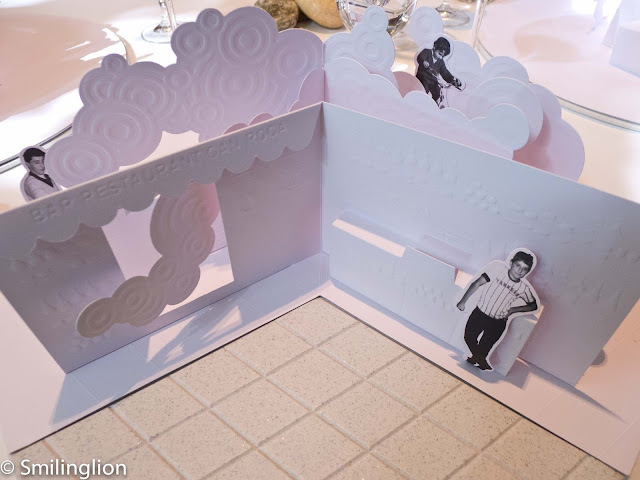 Then next was a pop-up card featuring the three Roca brothers in their youth. The card was then accompanied by some finger food which was also very good. 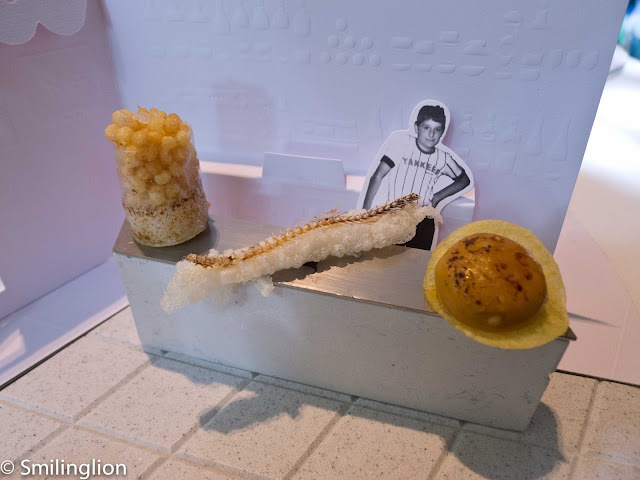 The title of this amuse bouche was: memories of a bar in the suburbs in Girona, and it features the breaded squid, pigeon bonbon, potato and onion omelet, anchovy bone in rice tempura and Campari bonbon. They then brought to our table an olive tree which had frozen olive ice cream spheres hanging off the branches which we had to pick off to eat. This was excellent. 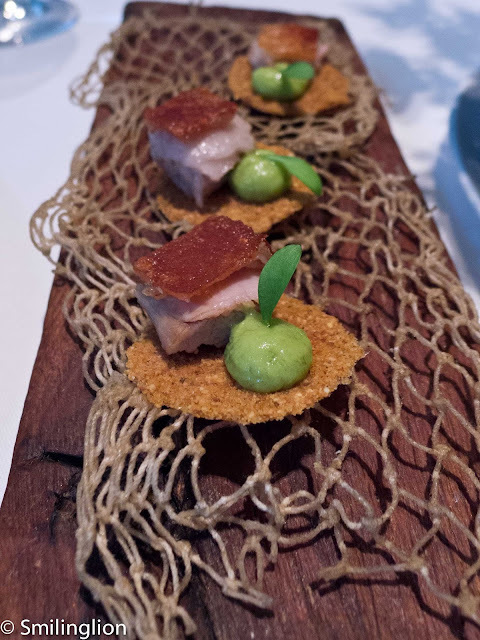 This was followed by another very good dish: the crispy corn with Iberian suckling pig rind (which tasted similar to the chinese-style crispy pork belly). 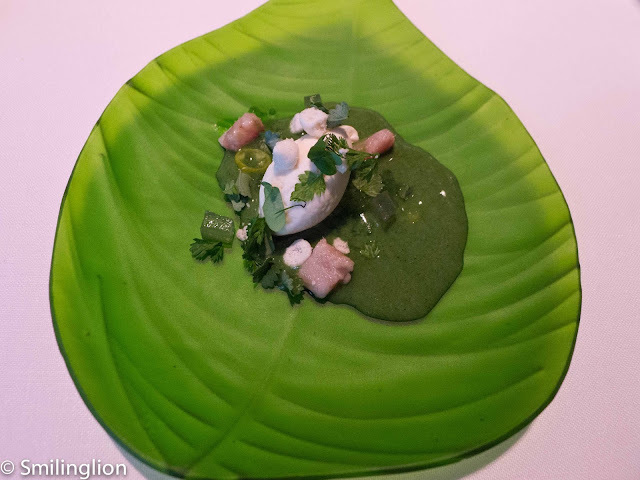 We felt that the cerviche (albariño sea bream ceviche) and the oyster with foam (pickled barnacles with bay leaves) was rather disappointing for their lack of real flavours. 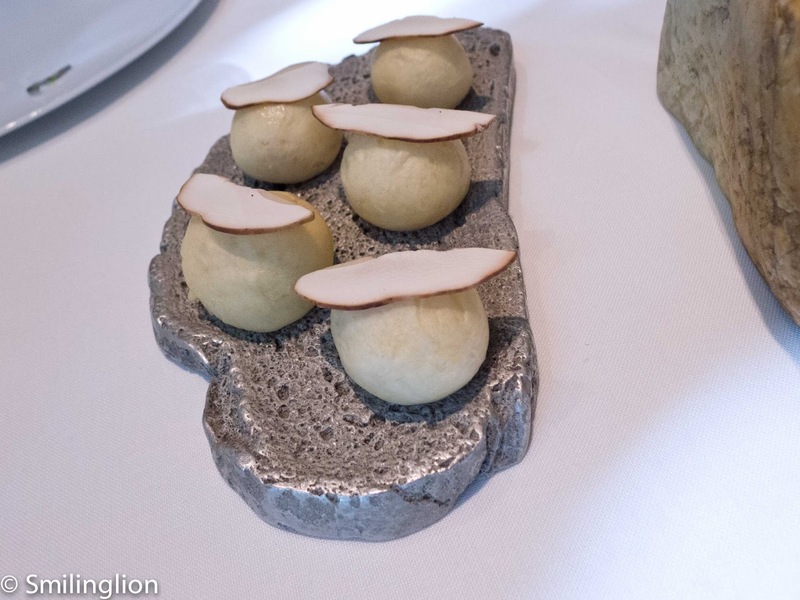 But we really liked the truffle 'stones' (truffled bonbons) and the white mushroom brioche (tasted very much like the chinese-style steamed buns). The first entree was the pumpkin consommé with green tea (hazelnut tofu, parsnip, liquified spinach, passion fruit juice, pumpkin seed, turnip and charcoal-grilled chestnut). 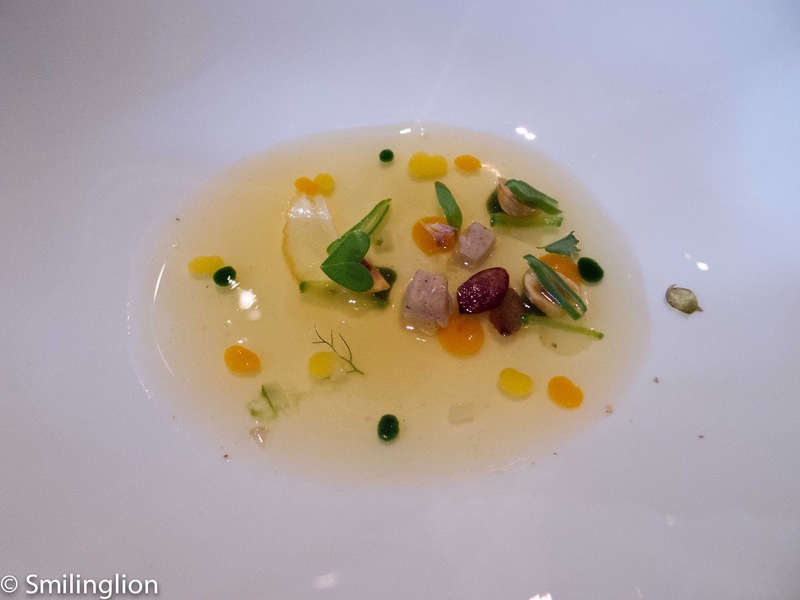 This was a very subtle dish, with each scoop of the consommé yielding different flavours when eaten. 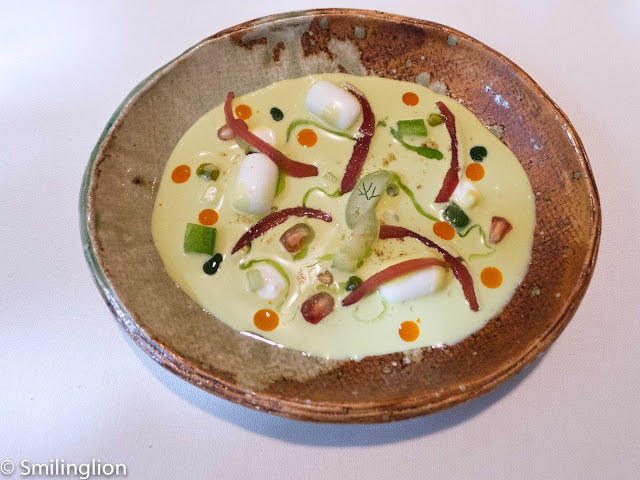 The excellent cold soup of pistachio, cucumber, melon, goat cheese and pomegranate had a strong hummus flavour (which was another Turkish reference common throughout the meal). 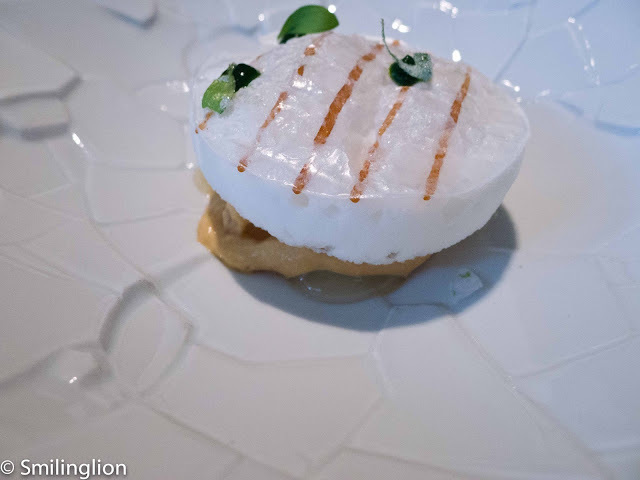 The "Ajoblanco" ice cream with meringue of Jerez, chlorophyll and sardine was an interesting mix of flavours, as was the red mullet with combo (col de dame fig, indian fig foam, sea anemone, salicornia, lime, PX jelly and Katsuobushi vinegar), except that we felt that the red mullet was too small and hence was overpowered by the (sourish) foam and figs. In addition to that, one piece of fish in the wife's plate was too undercooked and had to be sent back; to their credit, they took it away and brought a new dish back promptly without any fuss. 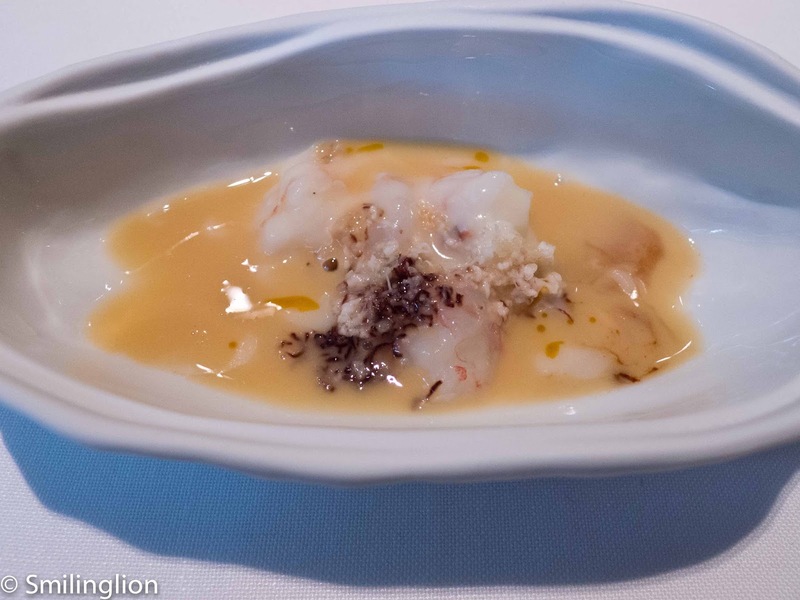 As seems to be the seasonal theme in Catalan at that time, like the meals we had in Sant Pau and ABAC earlier in the week, the next 2 dishes were shellfish dishes with an emphasis on the stock. 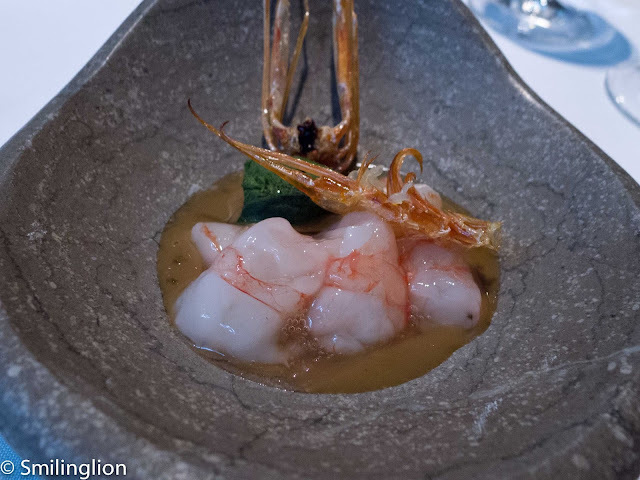 The prawn marinated with rice vinegar (head lice, crispy prawn legs, seaweed velouté and phytoplankton) was one such dish, with the use of umami-rich reduction and with the edible crispy prawn heads. We loved this dish. 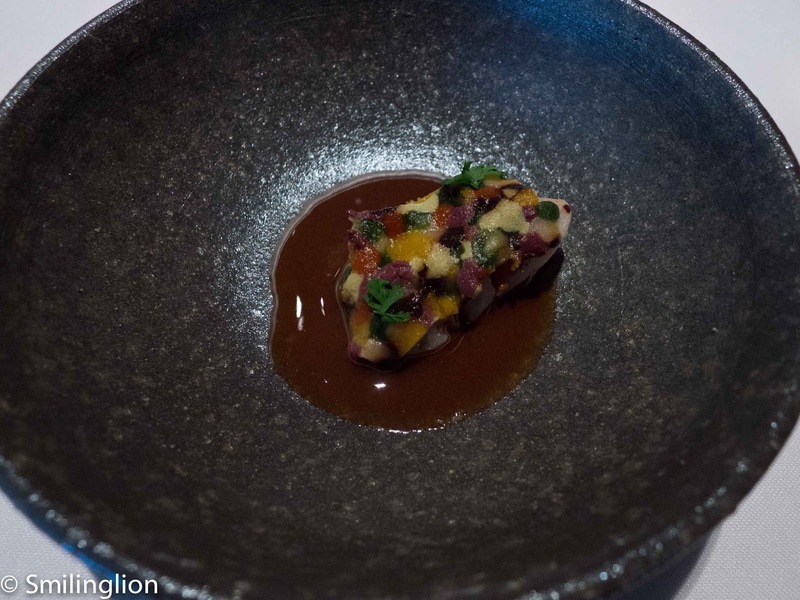 However, the charcoal-grilled langoustine with cocoa bean sauce (black mole with chocolate and mantis shrimp cream with cocoa and boletus edulis) was created with an entirely different flavour in mind: with a bean sauce which was sweeter and more creamy. We thought it worked very well too. 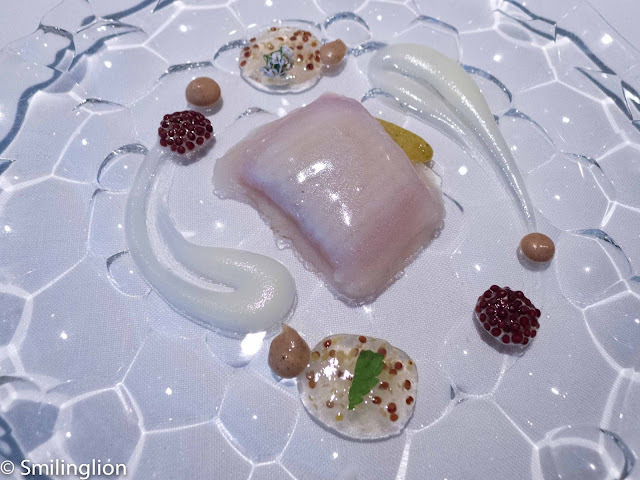 The confit skate with mustard oil, beurre noisette, honey, chardonnay vinegar, bergamot, aromatic mustard, confit capers and smoked hazelnuts was a missed opportunity to highlight a well-cooked fish, because the portions were too small. Likewise with the blackspot sea bream with "samfaina" (which is the Spanish version of a ratatouille), the sauce was really good but the fish was too small for us to sufficiently savour the dish. 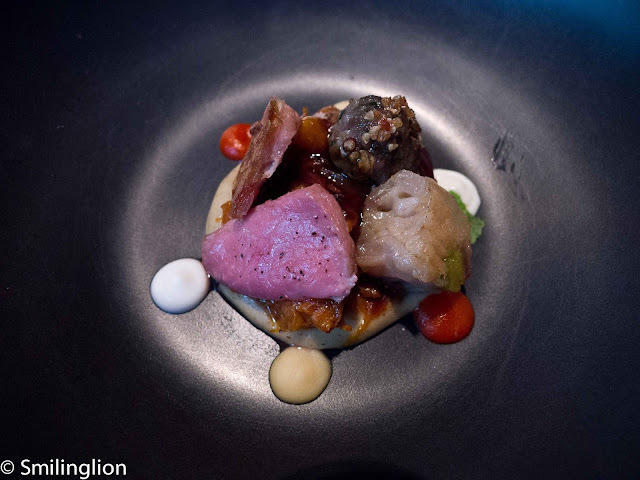 The Iberian suckling pig with strawberry tree fruit and pomegranate was excellent as was the lamb with eggplant and chickpea puree, lamb's trotters and spicy tomato. But the best main course had to be the veal oyster blade and marrow, tendons and avocado. 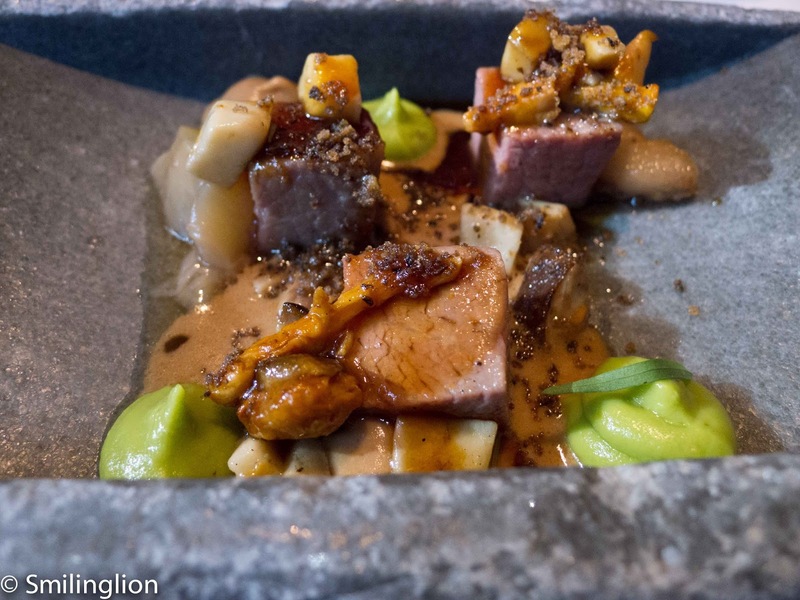 This was so tender and and full of flavour, with the avocado an clever addition to take some of the richness out of the dish. Desserts were at a totally different level. 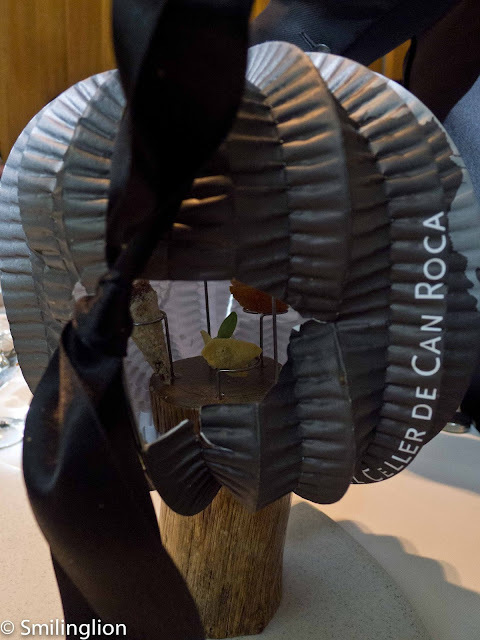 If we weren't yet convinced that El Celler de Can Roca deserved the accolades it gets, then youngest brother Jordi Roca put paid to any arguments. His desserts were themselves worth the trip. The "Suspiro limeño" (milk, lime, coriander, milk caramel, pisco) was a thin ice-encrusted milk over caramel and it was the perfect blend of refreshing sourness and creamy sweetness. A few months ago, we read somewhere that the Roca brothers were experimenting in creating their own perfume. It worried us slightly, that they were going deviate so far away from their core expertise (i.e. their cuisine) that they may eventually be distracted from their restaurant business. 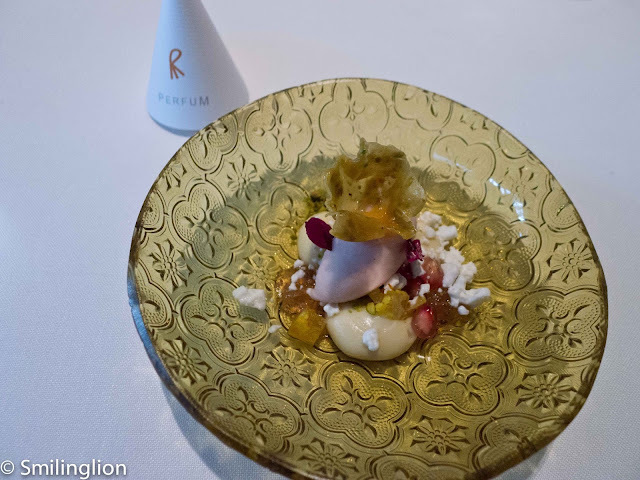 That may still be the case, but the Turkish perfume (rose, peach, saffron, cumin, cinnamon and pistachio) which they made as a dessert was a very successful attempt at this pursuit. The paper cone had the perfumed scent and we were surprised by how acceptable it was to us as a perfume. The final flourish came in the form of the orange colourology, a dessert so simple in concept yet sophisticated in execution that it could possibly the best dessert creation we have ever eaten. 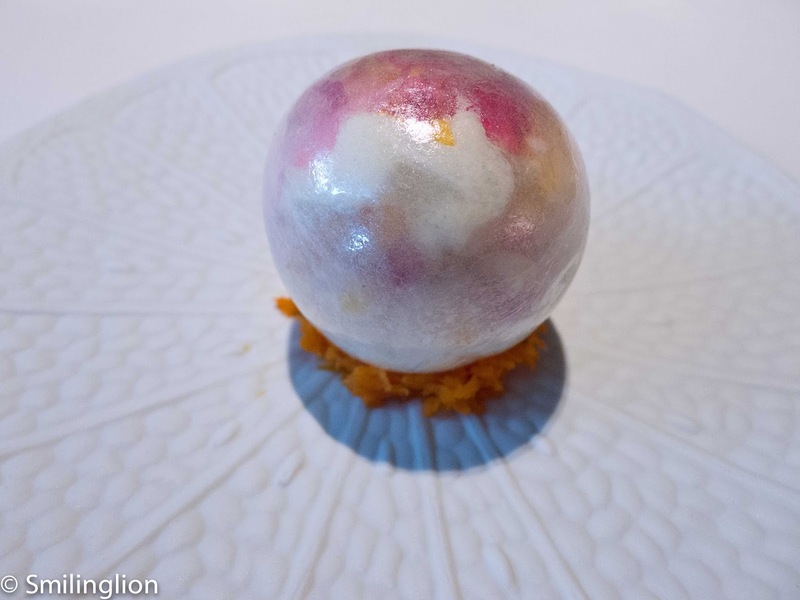 A sugar ball which contained all things orange: persimmon, carrot, mango, orange and probably some which we have forgotten, put together on a plate with perfect harmony. 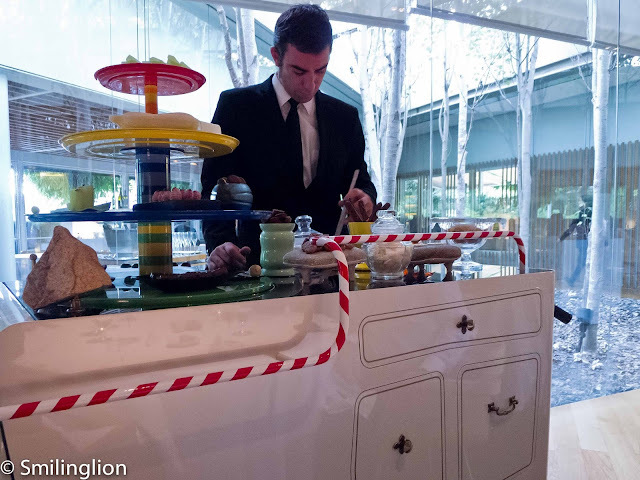 For post desserts, a sweets trolley rolled by and we had a good assortment of candy, jelly, madeleines, and chocolates. It was the end of a long but highly satisfying meal. 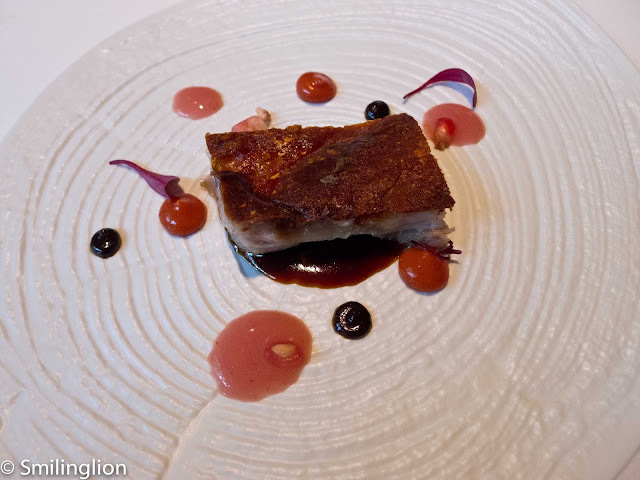 Granted, there were a few dishes which didn't wow us, and it didn't have the consistency of our meal at Sant Pau two days before, but for most part the meal was excellent and had many high points. The surrounds were beautiful and we dined in such comfort that afternoon, but it bears mentioning that we didn't think that the service staff had the polish we would normally expect from a 3 Michelin starred restaurant in Europe (service was good enough but our waiters were at times quite surly and somewhat lacked the experience and instinct we've come to expect at this level of dining). We postulated that the stress of trying to maintain such a lofty ranking could have stifled the customer-facing staff members to some extent. So, after 365 days of waiting and travelling more than 10,000 km, the question remains, do we think El Celler de Can Roca deserves its ranking as the San Pellegrino World's Best Restaurant? Truth is, we can't answer that question, because in a fortnight when we have also dined at quite a few other exquisite restaurants in Europe (each of which having wowed us in different ways), any fair comparison may not be possible. Instead, we reflect on the wonderful meal we had there, which was no doubt at the highest standards for a restaurant at the top of its game.